Research has shown us benefits of early childhood programs for the development of positive long term behaviors. It is our goal to make the focus of our efforts the education, and establishment of healthy living habits for an approach in prevention rather than treatment. The School Nutrition Education Program is federally funded by USDA and administered by the University of California Cooperative Extension to provide nutrition education in schools where at least 50% of students are eligible for free or reduced school lunch. We provide teachers with free curricula for easy integration in lessons to promote the importance of healthy lifestyle practices. Our curricula are research-based, pilot-tested and aligned with the current California Content Standards in Science, English Language Arts, Mathematics, and History and Social Studies. We know how busy teachers are, so all curriculum pieces contain concise background information on the topic, easy-to-prepare activities, parent letters that can be easily photocopied and snack ideas for each lesson. These experiences provide opportunities for children to actively learn about healthy eating and exercise. Each lesson is designed to meet the specific needs and abilities of preschoolers. These lessons offer simple messages by dividing the MyPyramid into three sections labeled Go, Glow, and Grow. Each of these sections correspond with the functions these food groups provide the body. Go Foods: Pasta, potatoes, breads and whole-grains. Carbohydrates and Starches. Energy and body warming. 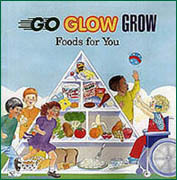 Glow Foods: Fruits and vegetables. Mineral and vitamin-rich sources. Protects and regulates. Grow Foods: Dairy, meat, nuts, beans. Protein-rich sources. Repairs and builds. A curriculum designed to illustrate the intricate connections made between gardening, farming, nutrition and their school cafeteria in food growth, packaging, processing and transit. Children also participate in fun, culinary activities when learning to create nutritious snacks, use proper sanitation and food safety practices to eliminate the spread of germs. Students also learn about aerobic, strength, flexibility and the need to proper hydration when participating in physical activities. Within engaging school gardening activities students learn about soil use, seed varieties, and germination. A literacy-based nutrition curriculum that uses poem, song, finger plays and reading to teach preschoolers and kindergartners the concepts of MyPyramid. Students will learn to identify and categorize foods within the five food groups. Each lesson provides the educator with easy-to-use, hands-on activities that expose children to healthy eating and fitness activity for lasting habits for a healthier lifestyle. While the new dietary guidelines recommend 2.5 cups of vegetables per day and two cups of fruits, many people fall incredibly short. The Five a Day Power Play! campaign was developed to encourage kids to consume 3.5 to 5 cups of fruits and vegetables and be physically active for at least 60 minutes each day. This curriculum integrates use of workbooks for extended learning in math, reading, and writing for meeting general education content standards. 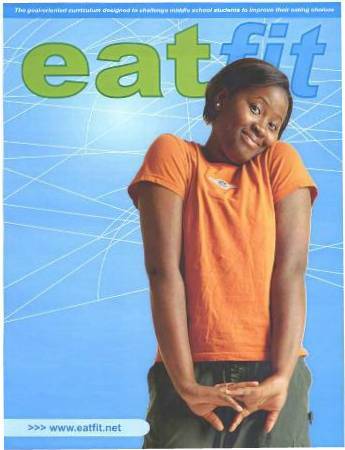 Our EatFit curriculum steers adolescents away from weight loss and dieting and directs them to a greater focus on leading a healthy lifestyle. Lessons address topics such as basic nutrition, health, physical fitness, body image, self-esteem, food label reading, food marketing, fast food, and healthy decision making. Course objectives include reduced fat and refined sugar intake, monitor serving sizes, increase physical activity and the daily intake of mineral and vitamin rich fruits and vegetables. Lessons and activities are correlated to content standards in math, science, and language arts. EatFit uniquely uses computer technology to generate a web-based diet analysis and guided goal setting for improving and sustaining long term healthy eating practices. Physical activities focus on cardiovascular, strength, and agility as students learn how good health influences one's overall mental, emotional and social well-being. For more information or to request any of the above curricula, please contact Suzie Lawry-Hall at sllawry@ucanr.edu or Jona Pressman at jmpressman@ucanr.edu.